I think these delis are famous in the way that reality TV contestants are famous. Which is to say, not famous at all. With the exception of Jerry’s Famous Deli, I think that they need to have their permission to use the word “famous” revoked. It just sets the expectations too high, and when they don’t follow through, I’m crushed. I think that from now on, if I go to a “famous” deli and the food ain’t up to par, I will insist that they change there name to insert name here‘s overrated deli. But, enough of me on my soapbox, let’s make with the review already. Agoura’s Famous Deli – On Kanan Rd, just east of Thousand Oaks Blvd in Agoura. I’ve been to this place quite a few times over the years. It’s close to my work, the staff is nice and the food is pretty fast. That’s a good recipe for a lunch spot. I hadn’t been there for a while, but just like old friends, I knew that as soon as I walked through the door, it would be as if I never left. Honestly, I don’t go here because the food is great. It’s really just a matter of convenience. I think we all need places like that, places that are comfortable and inviting. Let me give you an example. I went into Agoura Deli the other day after not having eaten there in a long time. While I was seated at the counter, one of the waitresses came up to me and said hello. I thought she was just being polite, but then she asked me where I’d been and even remembered that I drink diet coke. How’s that for service? Let’s just say, with the service I got at Brent’s, this was a million times better. The picture doesn’t really do it justice because it was taken with my cellphone. The cheese was definitely copious, but it was also not too sharp, which made it easier to eat. The egg was cooked well and the veggies were done right. I wasn’t wild about the carrots, but the zucchini and broccoli were that perfect firmness and tasted fresh. The mushrooms were a little dry, but I think that’s because they were more thinly sliced than the other veggies. 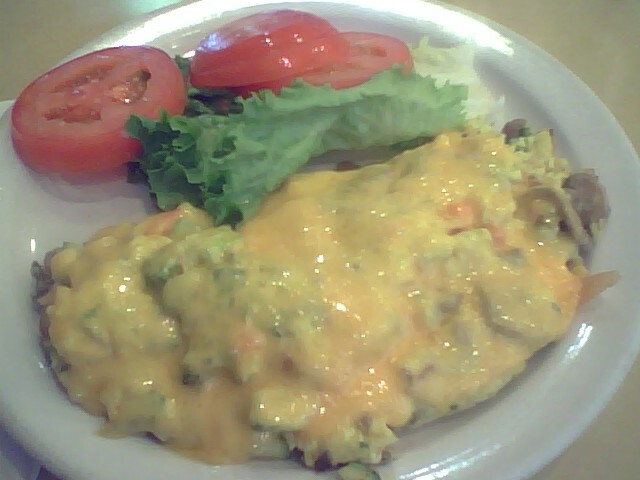 Overall, I think this omelette is pretty good. I liked the fact that they went with some non-traditional vegetable choices. For the carnivores out there, I would highly recommend adding some bacon to your omelette. I’ve had their bacon in a few dishes and really enjoy it. It is a thick cut and cooked to be pretty firm, but never once have I seen it burned. They also do a pretty good chili cheese omelette as well. The other breakfast item I love, besides omelettes, is breakfast burritos. So I just had to give Agoura’s a shot. I got it with the bacon. The other ingredients are potato, cheese and eggs. 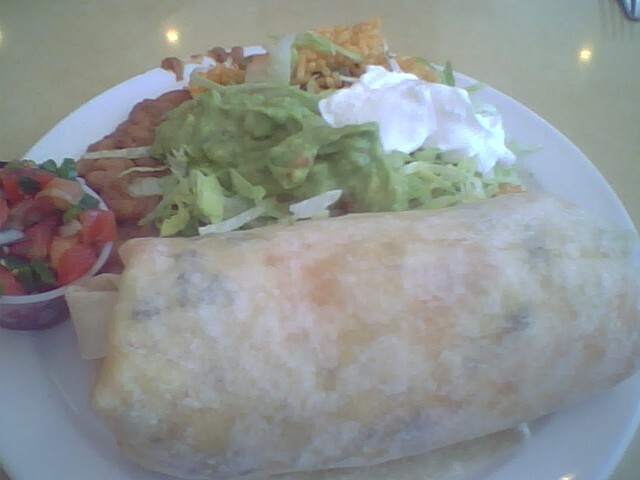 It’s huge and they also give you salsa, guacamole and sour cream to put on top and beans and rice on the side. It’s more food than has any business being on a single plate. I couldn’t even eat the whole burrito, let alone clean my plate. I can’t say that this is a really great breakfast burrito because there is too much potato and it’s not seasoned very well. It makes the burrito very heavy, as does the fistful of cheese that they throw in. Still, for some reason, I just couldn’t stop eating it. The bacon was good, but I think it was overshadowed by the massive amount of potato. The salsa is a nice touch, but it’s not as good as the kind you would get from an authentic Mexican restaurant. The guac and sour cream were on the runny side, so I just left them alone. I can’t really tell you about the beans and rice because I barely had room to try them. From the small sample I tried, the beans were the better of the duo. I think that overall the dish just lacked seasoning. I’m not much for using tablesalt to “fix” my meals, but I think in the case of the rice it may have been a necessity. Still, I enjoy this place and the servers who work there. The service is prompt and attentive which makes the average tasting food seem better. I don’t know if I can give them a wholehearted recommendation because I think that a lot of our readers might find them to be on the dull end of the food spectrum. But if you’re a picky eater who likes simple food, this may well be a perfect fit for you. I know I’ll keep them in the rotation, so maybe I’ll see ya there on my lunch hour. Everything is better with bacon. Every. Thing. Really. I couldn’t agree more. Too bad I only get to eat it when I’m doing reviews for the site.